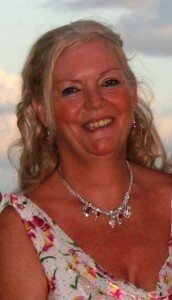 Jacqui’s life took an unlikely turn from teaching, when her husband accepted a job in Mauritius. They lived in a bungalow on the beach at the Southern end of the island which was virtually untouched by tourism. After organising a Christmas party in the back garden, for one hundred and fifty local children, Jacqui was left with a wonderful feeling of creativeness and felt inspired to write her first novel. What else was there to do on a beach in Mauritius once the party was over? Jacqui published her first novel, Husband Unknown, after winning an award for a short story. She spends her time between Broadstairs in Kent, England, and the Andalusian hillsides in Spain. When she’s not writing, she can be found walking her dogs and gathering ideas for her next book. Life inspires me. Most of my stories have some element of truth, not personal experiences I hasten to add. Most of my ideas surface when I walk my dogs. My characters come from real people that I adapt the meet the criteria of the story. As yet, no one has recognised any similarities. I like to have the base of the story on good old-fashioned paper before I begin to write. Then, of course, it all changes as I develop the plot. I talk to my characters as I walk my dogs. Don’t laugh – sometimes I call my dogs back and use a character name by mistake. My husband has some experience of this too. Luckily he’s understanding and just shakes his head. Love what you do and make every word count. Friends and family persuaded me to published after reading my early novels. It will go on forever. Some people like paper books and others digital, so the world is a never-ending book.